To celebrate a year of book blogging I will be giving a present to a lucky someone! How Do I Enter? To take part all you have to do is fill out the comment form below, making sure you have a working email address, and tell me in 25 words or less – What is your fondest birthday (or celebration) memory? What Is The Prize? 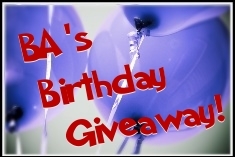 The winner will get the chance to choose a book of their choice valued at up to $25AUD from The Book Depository. Who Is It Open To? International* and no you do not need to be subscribed or subscribe to enter. *The competition is international, but only includes the countries that BD delivers to. Please check this list before you enter. **The start and end times listed are Australian Eastern Daylight Savings Time. ***The winner will be contacted via email and then have three days to respond from the time of the sent email. In the event that the winner does not respond a new winner will be drawn. Note: Please keep in mind that in order to have this competition open internationally I am using a company I have no affiliation with. This is out of pocket and not a promotion for BD. All responsibility for the book during shipment is not my responsibility, but BD’s. However if anything goes wrong I will follow it up for you. Deliveries can take up to two weeks depending on where you are with a bit longer due to holiday times. My fondest celebration was Australia Day last year. After my friend’s citizenship ceremony and lunch at a Japanese restaurant, I went to The Rocks as they had free entertainment. I sat and watched Jeff Lang work his magic on that guitar and was blown away at his prowess. I was mesmerised by Ash Grunwald (one hot man who blew me away with his music making) and later I saw Bertie Blackman play for the first time. She packs a punch! I still count these as some of my favourite Australian acts to see live. In 1997, my 18th birthday out of state road trip to Lollapalooza in George, Washington. I saw Devo, Ramones, and Metallica. I wore KISS makeup. My fondest birthday memory probably was the party my family held for my 6th birthday. All my friends were there and my grandma made my favourite sandwiches (is it weird that I remember that? I still love them!) and then we went to the beach and played in the sand. I have two favourite birthday memories, one is vague and blurry because I was five, I remember being super-excited because I got an icecream cake in the shape of a clown’s head. I thought it was the most awesome thing ever! Second one is from a few years ago, money was tight and I wasn’t expecting anything much for my birthday, but when I got out of bed I found my partner had gotten all of my favourite kid’s birthday party treats and created a feast for me 🙂 It was unbelievably sweet. I can’t remember my fondest birthday memory, that must mean it was epic, right? So epic it would blow people’s minds to hear it I bet. Umm my fondest would probably be when I was 15 and all my friends stayed over at my house and we stayed up all night and we were just really close and it was really fun. My fondest birthday was going to a fondue restaurant with the boyfriend and also whipped cream and strawberry cake.